Picture the cozy setting of a crackling fire, the two of you sipping après ski toddies after an invigorating day on the snow-covered slopes. Perhaps you might even have the good fortune to get snowed-in. This Relais and Chateaux lodging property in Sugarbush Vermont oozes alpine charm with a dose of nearby vertical. The Pitcher Inn in Warren, Vermont, the gracious staff will carry your ski bags and light the fireplace in your themed room. 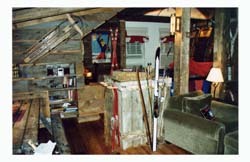 Each room of this 1993 authentically rebuilt Inn has a unique character. The Mountain Room, the Trout Room, and the Mallard Room are a few of the sixteen architecturally appointed suites. We recommend the Ski Room, modeled after a vintage ski lodge and filled with memorabilia including wooden skis and a flexible flyer sled, even a hand painted 1950’s ski mural. Sounds rustic, but it is actually extremely well-appointed, right down to the steam shower and the hidden TV that magically appears from beneath a genuine ski area “lost and found” bin. The Hollywood film crowd frequents this one of a kind Vermont Inn and their full service Alta Spa across the street, but the innkeeper would not reveal names. Good innkeepers don’t kiss and tell, out of respect for their guests’ privacy. Too bad, it would have made a great anecdote – Hollywood moguls descend upon Vermont moguls. The Pitcher Inn, The Alta Spa, and The Warren General Store are all owned by Winn Smith, former Wall Street Tycoon turned ski resort owner. 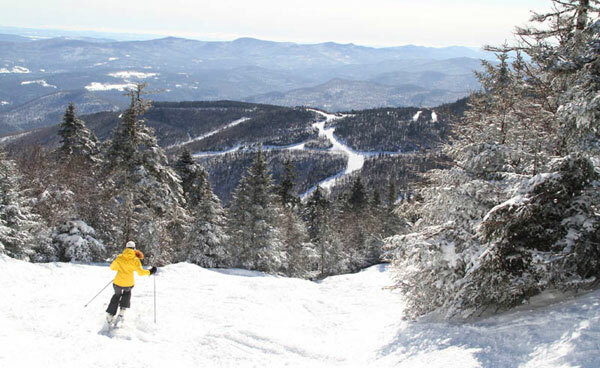 Winn purchase Sugarbush Resort from American Skiing Company (the empire that Les Otten built) and has reinvigorated the ski resort’s base village and the locals’ attitudes over the past few seasons. Ski nearby Sugarbush or Mad River Glen (note: now snowboarders allowed at MRG) by day and return to your special themed room at the Pitcher Inn each night. Even Cupid would give alpine approval to this getaway.